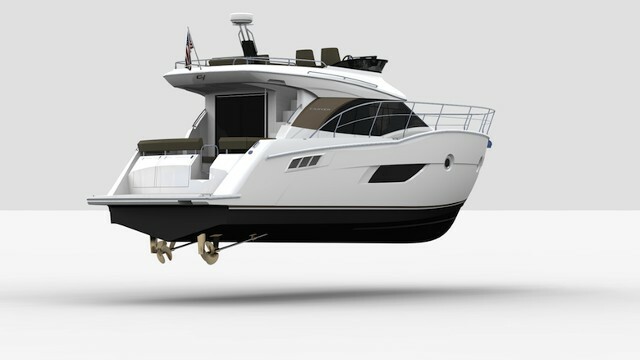 Carver’s new offering combines good value, smart spaces and solid construction in a big family cruising yacht. 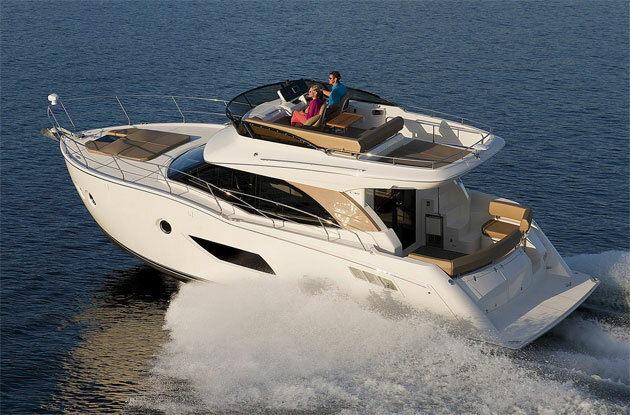 What do most of us want in a luxury cruising boat these days? If you take a quick poll among your opinionated neighbors at the marina, they’ll probably put long-term dependability on their hot list. Anyone who makes an investment in a boat built to go the distance—both in nautical miles and the number of years it will run from one lovely port to the next—wants to know it will hold together for a long time. And if it has lines and accommodations styled to look distinguished in any decade, all the better. 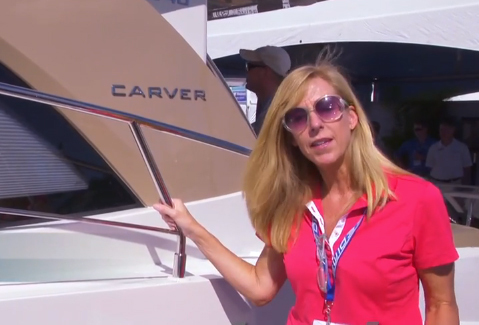 For those who value longevity, then, there’s the new Carver 54 Voyager. 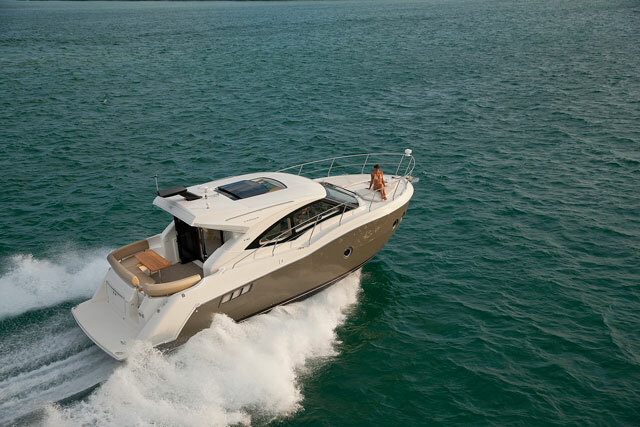 The Carver 54 Voyager is a well-conceived luxury package, built to high standards with proven techniques. This three-stateroom command-bridge cruiser is manufactured by a Pulaski, Wisconsin-based company that’s been in business for more than fifty years. 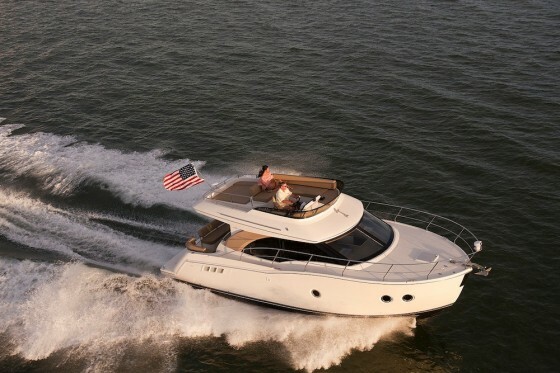 Carver has made its reputation by satisfying cruising families with a line of boats that are built solidly, priced competitively, and equipped with all the safety gear, creature comforts, and modern systems required to get out there and see some new places. The Voyager Series, which is comprised of four models including this 54, is Carver’s command-bridge line. As such, it’s designed for those skippers who like to drive from an upper helm on pretty afternoons but prefer more warmth and comfort on crummy days, when even the best foul-weather gear can’t seem to keep you happy. The command-bridge deck features plenty of lounging areas, as well as a dining table and bar. The lower helm station on the 54 is a bit unusual. It’s located a level up from the saloon and in the same space as the galley. The setup reminds me of some new homes where kitchens comingle with living spaces to keep everyone closer together. 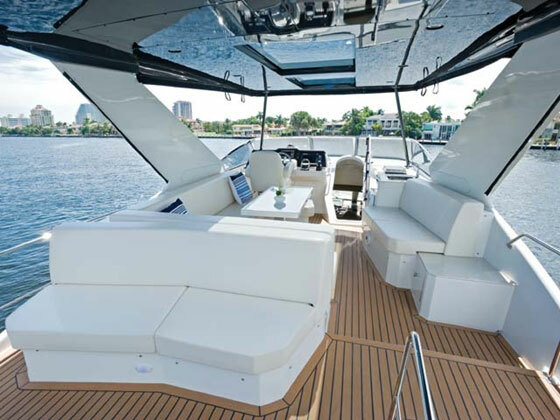 If this layout is too modern for your taste, you can replace the lower helm with a conventional dinette. Whether you run the boat from above or below, navigation will be straightforward. Visibility forward and to the sides is good; when you need a clear picture of what’s happening at the stern, check the video monitor (there’s one at each dashboard). 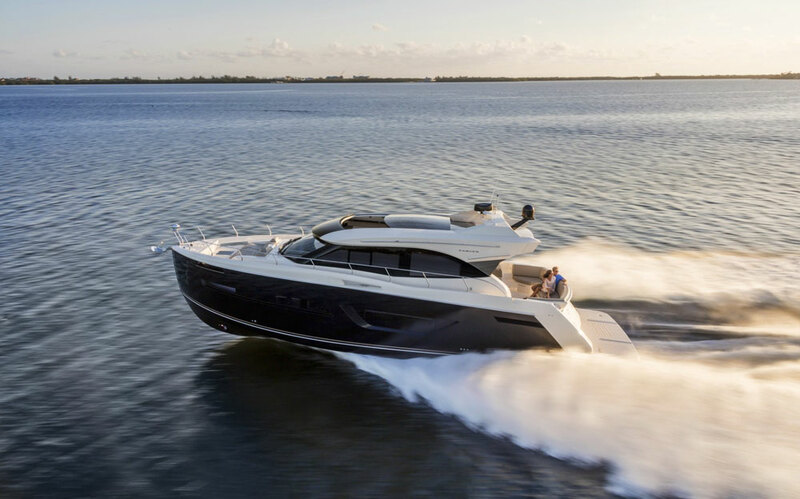 The helm is also the home of the proven Carver Docking System, a user-friendly controller for the 8.7-hp bow and stern thrusters that provide 286 pounds of thrust. You’ll like it when the wind is blowing steady at 15 knots and you’re scratching your head wondering if the windage offered up by the boat’s high sides will challenge your hard-won docking skills. The Carver system was made for moments like this, and it’s proof of Carver’s commitment to provide owners with a good experience on the water. 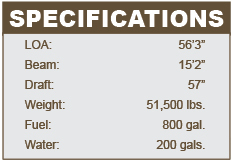 Twin diesel propulsion is available either from Volvo (D9 EVC-500-hp or D9 EVC-575-hp) or Caterpillar (CAT C9 575-hp). The full-beam saloon is on the same level as the aft cockpit. Open the sliding glass door to create a tremendous indoor-outdoor flow. 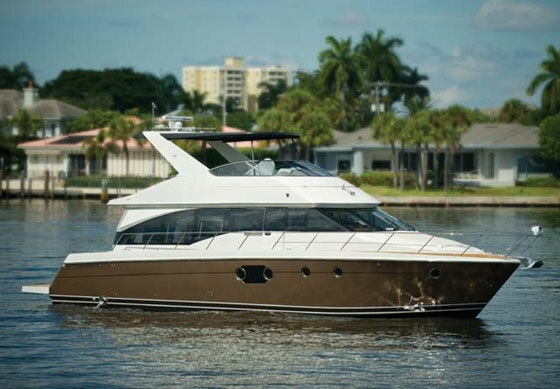 Like all Voyagers, this one puts an emphasis on big, livable spaces that are smartly planned and offer plenty of headroom (6’11” in the saloon on the 54). 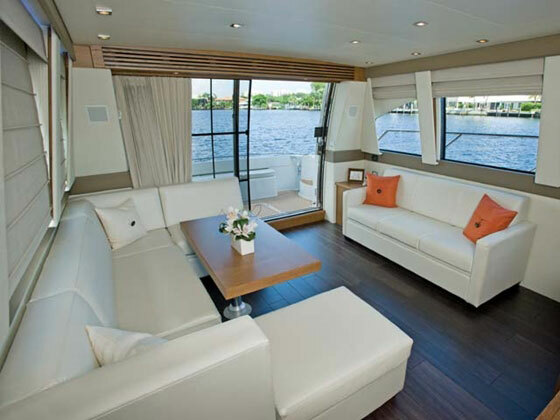 There’s room to entertain the whole crew on the bridge, where there are lounges, a dining table, and a wet bar. We also like the fact that the hardtop is standard—you don’t have to pay more for cool shade on a hot day. Access to the bridge is good too, thanks to an internal stairway that leads up from the galley, although there’s an external stairway as well. There’s more entertaining room below in the full-beam saloon. It has a huge sliding glass door that leads out to the cockpit. Because the two spaces are on the same level, you can have one seamless space for guests to meander through when you push the door wide open. Décor is minimalist chic, with squared lounges in light upholstery that contrast quite nicely against the Zatara oak hardwood. This simple and elegant look is one you’ve seen recently on yachts much larger and more expensive than the 54. 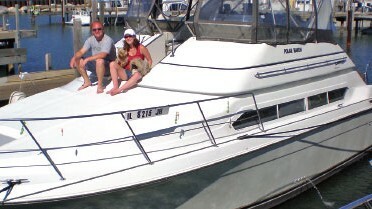 The 54 is built on the standard Voyager hull built with the company’s proven fiberglass construction techniques. The hull is solid glass with no wood beneath the waterline. Above it, closed-cell foam and balsa core add strength without weight. When it comes to construction, Carver also likes to tout its extensive use of corrosion-resistant metalwork with 316 stainless-steel. The 54 Voyager retails for $1,156,000 with the 575-hp Volvo diesels. For the investment, you get a complete package: home-style comfort in big spaces, classic style, reliable engineering, value, and longevity.